The following images are as shocking as they are hard to comprehend. The damage to this shark is simply stunning. 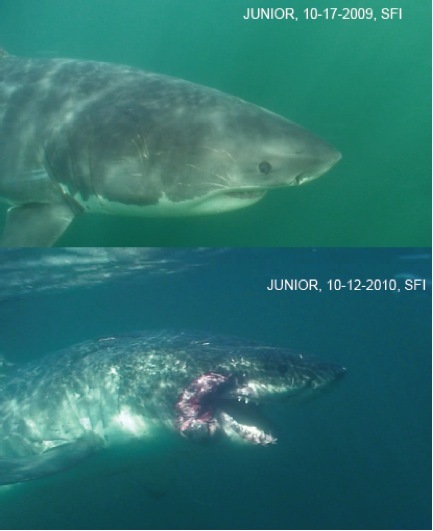 They are purported to be "before and after" images of a protected white shark that was mauled at the Farallone islands in 2009. A shark by the name of Junior. The shark was badly hooked by a hybrid shark research/film crew in the fall of 2009. The hook was set so badly in the animal that a pair of industrial bolt cutters had to be pushed through the gills of the shark to cut the hook. Two thirds of the hook was left inside the animal. If this is in fact the same animal and these images can be verified, it is clear evidence that this brand of hybrid film and television shark research should be banned from the Sanctuary. Permanently. Doesen't surprise me, I was wondering how much the "shark men" had to pay to get access to wrangling the sharks in the sanctuary? Well, these days its all about the money, I wonder how they got the repeat photos? Regardless, I hope they stop these guys, that shark looks pretty beat up. Very good points Denise. Thanks for posting. Have you seen the show? It’s the farthest thing from research you can get. It’s a bunch of yahoos! I can't believe the damage they must be doing to all the legitimate research that is going on. They should be banned the from the OCEAN permanently. In the episode that I watched, the supposed doctor/vet was collecting a sperm sample, and didn't actually know what to look for or collect!